Julen Lopetegui was finally fired by Real Madrid.! Lately the bad news comes from giant soccer clubs Spain...Not until half the season, Lopetegui must be willing to pull out of the Santiago Bernabeu with shame. A number of embarrassing results make El Real officials no longer believe in Lopetegui. The culmination of the El Clasico results yesterday, Real Madrid lost a landslide 1-5 of Barcelona. Real Madrid, which was left behind by Zinedine Zidane in the summer, was linked to several coaches with big names. But it turned out they were pointing Julen Lopetegui to replace Zidane. Worse, at that time Lopetegui's status was still the Spanish national team manager who wanted to play in the 2018 World Cup. At that time the announcement of Lopetegui becoming a Real Madrid coach seemed to make the Spanish football federation angry. Two days before Spain played in the World Cup, Lopetegui's position was removed! In return, Spain was handled by Fernando Hierro in Russia 2018. The first impression given by Lopetegui to Madridista is also not good. His first official match as Real Madrid coach must end in defeat, especially against their city rivals, Atletico Madrid. Real Madrid must surrender 2-4 in the European Super Cup. After losing the European Super Cup, Real Madrid under Lopetegui returned to being fine at the start of the season. But after entering September, or rather after losing 0-3 to Sevilla, the Real Madrid crisis began. Lopetegui even made Real Madrid make a bad record in the history of the club, failing to score for 481 matches. 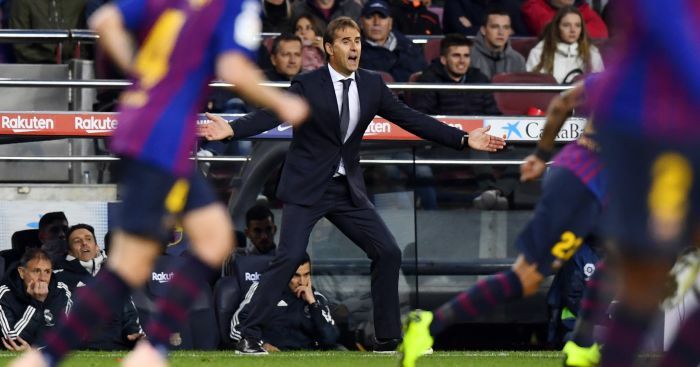 The media have talked a lot about El Clasico being the fate of Lopetegui. And it was true, Real Madrid were beaten by Barcelona with a landslide score, 1-5! Losing in El Clasico might be a normal thing, but losing with a landslide score seems like there's no mercy anymore. After being humiliated by Barcelona in El Clasico, it was time for Lopetegui to leave Real Madrid. He was fired and his position replaced with Real Madrid coach Castilla, who is also a former El Real player, Santiago Solari. If you see it, it's really like it seems like this Lopetegui was fired. The entry is not good, eh came out, I'm not surprised if it's fired like this. How about this for football lovers, do you agree with Lopetegui's dismissal and Solari's appointment?